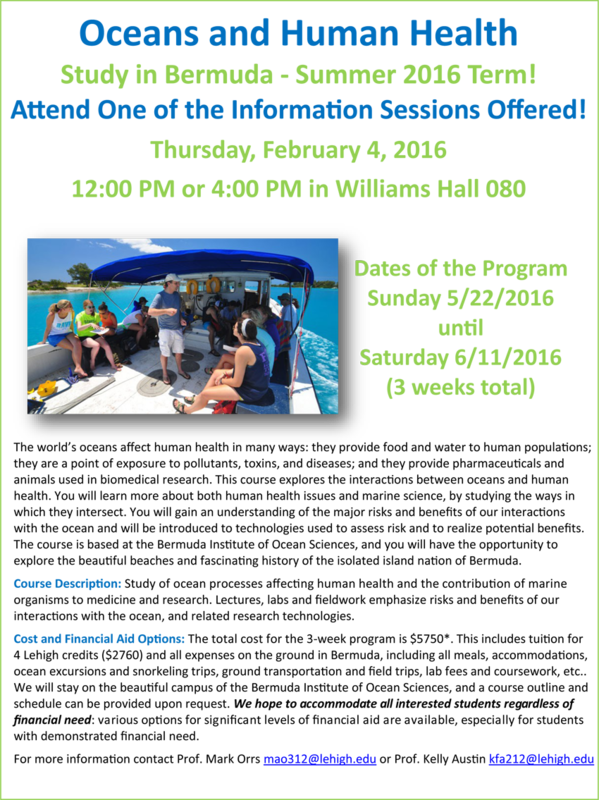 Study in Bermuda - Summer 2016 Term! Attend One of the Information Sessions Offered! Cost and Financial Aid Options: The total cost for the 3-week program is $5750*. This includes tuition for 4 Lehigh credits ($2760) and all expenses on the ground in Bermuda, including all meals, accommodations, ocean excursions and snorkeling trips, ground transportation and field trips, lab fees and coursework, etc.. We will stay on the beautiful campus of the Bermuda Institute of Ocean Sciences, and a course outline and schedule can be provided upon request. We hope to accommodate all interested students regardless of financial need: various options for significant levels of financial aid are available, especially for students with demonstrated financial need.